The 5 part drama debuted internationally in October. 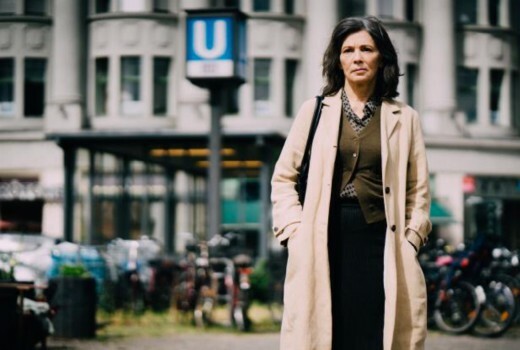 For decades, Freya (Iris Berben) has been transcribing criminal interrogations for the Berlin police department. She lives a secluded life, haunted by the gruesome accounts of violent crime – and even more by the disappearance of her daughter Marie, 11 years earlier. An old friend, Henry takes over the department as new police commissioner. As their friendship gradually turns to love, Freya suddenly feels something akin to happiness for the first time in years. However, a similar case brings old memories back, and she resolves to finally get to the bottom of Marie’s disappearance – especially when evidence suggests that the two cases could be linked. Taking matters into her own hands, she initiates some unconventional investigations of her own, and finds out more than she bargained for. Henry, too, gets closer to the truth – and to Freya’s own dark secret. Their newfound love suddenly in jeopardy, Freya must decide if justice is worth the sacrifice. 11.35pm Monday, 22 April on SBS. This reads like it could be a good show to record given the air time is 11-35pm. Hopefully it’s in English and no sub-titles. Oops! Am I allowed to say that?